EZ cPanel Secrets - Everything You Need To Know About cPanel Is Fully Revealed! Does the thought of logging into cPanel make your sking crawl? This video series teaches you and your customers everything you need to know in order to unlock the full potential of cPanel in your business! The majority of your websites are controlled via a web hosting panel that goes by the name of 'cPanel'. Perhaps you use parts of it or maybe you don't. But oftentimes it goes unnoticed. It becomes underutilized, or not even used at all. How Can You Use cPanel's Bigger Features To Take Your Website To The Next Level? This Step-By-Step Video Series Shows You How To Unlock The Power Of cPanel To Run Your Websites More Effectively! There are so many cPanel videos out there that cover the basic features of cPanel, but they never really dive into the core of what cPanel offers. You'll be shown features of cPanel that you can use to truly take your business to the next level of success, not just to maintain your website. Knowing what goes on in your website is crucial. What's the difference between Awstats and Google Analytics? Not only will you be given an overview of Awstats, but you'll learn different features of Awstats that, if used correctly, can help you increase your website traffic and protect it as well. Softaculous replaces Fantastico, which was a popular suite of software scripts that may fit many aspects of your business. It gives you access to blogs, bulletin boards, support helpdesks, and more. You'll be given an overview of this suite and how to use it properly, and we'll also show you how to install WordPress with a few clicks of your mouse using this. Did you know that you could be losing traffic when people land on areas of your site that don't exist? This is where the 404 error page comes in. What if you could redirect all that traffic back to your main page or a working area of your site? Well, in this video you'll learn how to redirect traffic from your error pages back to your main site. Grab This PLR Video Series Now And Learn How To Unlock The Power Of cPanel To Run Your Websites More Effectively! So you can get over the techy stuff and realize the full potential of cPanel in your business, and finally get more sales and see the success you've always wanted to achieve! P.S. 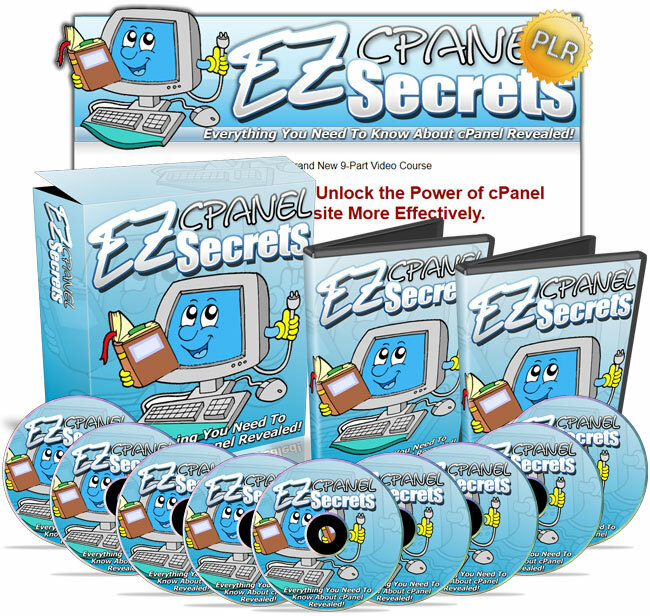 EZ cPanel Secrets will take your knowledge of cPanel to a deeper level, instead of just the basics that you'll find all over the 'net! P.P.S. Have you tried other cPanel tutorials and had no success? Unless you take drastic action right now, nothing is ever going to change. Don't wait any longer! Everything taught here is all based on real experience - there's no theory or guesswork involved. You'll be amazed at how simple and easy it will be to apply the techniques found in these videos!